Last time I was at Fort York was for a War of 1812 re-enactment, presented by the Conservative Party of Canada. (I played General Harper Lee.) But this time was a lot tastier. We’re talking Taste of Toronto, an all-day, four-day foodfest serving up some of the best dishes from all over this city. Now as soon as I walked in and saw a long-haired dude roasting lamb on a spit, I knew that I was in the right place. They’re serving it up righteous-style with bulgar salad and some freaky tzatziki, dude! Now, I don’t always eat salad, but when I do, I make sure it’s got roast pork, crispy pork skin, peanuts and pickles on top. This Indonesian dish brings the heat like Doc Halliday in his prime! How do you make ribs even better? Cook ’em in a root beer sauce, toss some corn nuts on top and smother with a nice jalapeno puree. This dish was equal parts crunchy and munchy! Speaking of root beer, I’ve wanted to try Mill Street’s boozy version ever since I first heard about it in a back alley behind an A&W. (Don’t ask me what I was doing in a back alley behind an A&W.) And I gotta say, they really nailed it. The carbonation is spot on, nice fizz to it, and while it tastes a lot like root beer, it’s also got a good rummy, boozy, kick. I would smuggle six of these into a youth soccer game…and I don’t even have kids! Speaking of cool refreshment, this one goes straight down…to Mexico. Can you say avocado popsicle, bro? Man, this would go great with some frozen nachos! Of course, it wouldn’t be a food fest without some winner, winner fried-chicken dinner. This two-piece combo is served Taiwanese style with some red hot chili peppers and two kinds of dipping sauce. Can’t stop me Flea, I’m addicted to this chicken! Now, when I was a kid, I ate so much calamari at the Olive Garden that I think they even named an octopus after me. But I never had it inside a bamboo charcoal bun…until today. Speaking of burgers, I heard that the Richmond Station serves up a mean one. They stuff it with short rib and serve it medium-rare with beet chutney and aged cheddar on a milk bun. I wouldn’t normally pay 10 bucks for half a slider–pretty sure I could eat 12 of these–but in this case, it was worth every nickel (y’know, cuz we don’t have pennies anymore)! Now, most people would probably stop there, but most people don’t have a tattoo of Guy Fieri on their lower back. And you know Guy would go crazy for these real-deal burnt ends, served up on a wafer made out of sticky rice. Dude, this is body by burnt ends on a sticky-rice wafer! Now, the first time I went to Kintori Yakitori, they didn’t knock my socks off. But this time, I went with the squid. Cuz whether it’s grilled or deep-fried, you really can’t go wrong with calamari, chico! Dude, I haven’t eaten this much food since I scarfed down 17 tacos last weekend! And I’ve still got room for BBQ tonight, cuz that’s how I roll…literally. I just tucked my legs in and made like Randy Bachman all the way down to the subway, son! BC Lions: Kokanee. “Glacier fresh tasting Kokanee, it’s the beer out here!” Because as much as a Lions score puts a bad taste in my mouth, I still don’t wanna drink crackhead piss. Saskatchewan Roughriders: Old Style Pilsner, what else? Winnipeg Blue Bombers: Labatt Blue. If I have to explain this one to you, you probably think the sky is clear. Hamilton Tiger-Cats: I used to drink Steelback when the Stamps played the Tabbies, but when they went belly-up last year, I decided not to switch to Steeler, even if it’s advertised at Ivor Wynne. (You can only buy that stuff in hobo-sized 950 ml cans, anyways.) Instead, I’ve switched to Tiger Beer, a pale lager from Singapore that’s actually quite tasty. And yes, I do have a few of these in the fridge for today’s Touchdown Atlantic contest. Ottawa Redblacks: Dinner Jacket O’Red IPA. 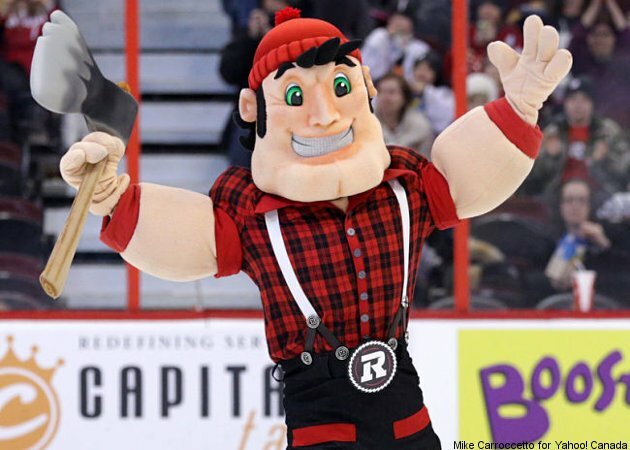 Hey, it has an O for Ottawa and the word “red” in its name, and it comes in a black can adorned with the kind of outfit that Gros Jos would wear. Montreal Alouettes: Molson Dry. Because you haven’t been Montreal drunk until you’ve double-fisted half-a-dozen two-dollar Molson Drys at Les Foufones Electriques. When you’re singing along to Bon Jovi, Mononc’ Serge and some French songs you’ve never heard before at 2 am, that’s Montreal drunk. Toronto Argonauts: Steamwhistle. Even though the Argos aren’t very good, I like to drink the best Toronto beer when they play my team. Mind you, I only go through one sixer of Steamwhistle a summer, since I tend to attend the Stamps @ Argos game in person–and they don’t even serve it at Rogers Centre, which is right next to their freakin’ brewery! Looking forward to the start of a new CFL season this year! UPDATE 06/24/18: Looks like Dinner Jacket O’Red IPA has been discontinued–it’s no longer listed on the LCBO website. This year, I’m trying out Black Creek Brewing’s Canadian Frontier Bitter Ale as my Ottawa REDBLACKS beer…but I’m open to suggestions for a more fitting beverage. Now, you won’t normally find me up in Forest Hill on a Tuesday, unless I’m pounding back the cold ones at Starbucks. But I heard there’s this funky little BBQ joint on St. Clair West that’s serving up real-deal chicken ‘n ribs on Tuesdays, Fridays and Sundays in the evenings—but only until they run out. The place is called Stockyards Smokehouse and Larder, so you know my lardass will be right at home! And hey, even on Tuesday they were all outta chicken by 7:30, so you’d better get there early!